Here's the first trailer for Lawless, née The Wettest County in the World, a.k.a. the long-shelved Prohibition thriller featuring Shia LaBeouf, Tom Hardy, Jessica Chastain, Gary Oldman and Guy Pearce dealing in all kinds of low-down bootlegging shenanigans. Violence? Check. Romance? Check. Clipped, moody dialogue courtesy of Hillcoat's Proposition screenwriter/punk prophet Nick Cave? Hell to the check. Cannes competition, here we come! Hollywood's biggest (and possibly most anticlimactic) night is upon us, which can only mean one thing: Movieline's third annual Oscar Liveblog Extravaganza! Join your Movieline editors and loyal readers as we parse the Academy Awards to within an inch of their glamorous lives. The fun begins on the red carpet at 7 p.m. ET/4 p.m. PT, with the Oscarcast proper commencing at 8:30 p.m ET/5:30 p.m. PT. And in any case, keep abreast of this year's Oscar class with our commentary after the jump. Anyone Wanna Buy Gary Oldman's Tinker Tailor Glasses? Forget Transformers TV spots and Oscar frontrunner Jean Dujardin's racy French posters; let's talk about Best Actor nominee Gary Oldman and the Jersey Shore bump he's about to get from this dramatic reading of Snooki peeing her pants. Jimmy Kimmel put the Tinker, Tailor, Soldier, Spy star up to the stunt on his late night show -- Which is on television! That thing that Oscar voters watch! 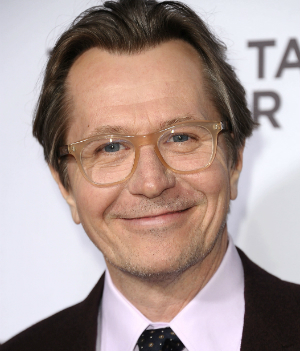 Focus Features and the good folks at WNYC are going all out for first-time Oscar nominee Gary Oldman, lining up a six-film retrospective of the actor's work that will culminate Feb. 8 in Manhattan with a screening and Oldman Q&A for Tinker Tailor Soldier Spy. The best part: It's free. Which naturally means you'd better act fast to reserve your seats. This reaction quote just in from Gary Oldman, a deserving first-time Oscar nominee for Tinker Tailor Soldier Spy: "This afternoon in Berlin I have learned that I was nominated for an Academy Award in the category of Best Actor. You may have heard this before, but it has never been truer than it is for me today, it is extremely humbling, gratifying, and delightful to have your work recognized by the Academy, and to join the celebrated ranks of previous nominees and colleagues. Amazing." Meanwhile, how is viciously smacked-down Oscar snubbee Albert Brooks doing? Give the Academy some credit: They made awards season fun for a little bit longer. At least my mind was blown this morning as AMPAS president Tom Sherak and Jennifer Lawrence announced The Tree of Life, Extremely Loud & Incredibly Close, Demián Bichir and a few other shocks among the 2012 Oscar nominations. We're a little more than half a day away from learning who and what will compete for the 84th annual Academy Awards -- an elite class through which Movieline's Institute for the Advanced Study of Kudos Forensics had combed for four months in its fail-safe, fool-proof and bracingly handsome Oscar Index. This calls for one last sweep through each of the Academy's categories (with the exception of live-action, animated and documentary short, about which even our pointiest-headed Oscar wonk cannot speak yet with authority); check our team's work against your own, and drop back by Movieline tomorrow morning at 8:30 a.m. ET/5:30 a.m. PT as we deliver nominations, reactions, analysis and more. After premiering this past weekend before Sherlock Holmes: Game of Shadows screenings, the latest official trailer for The Dark Knight Rises has hit the Internet today. Depicting a Gotham City eight years after the events in 2008's The Dark Knight, the trailer teases societal upheaval, (literally) explosive football plays and best of all, two new villains: Anne Hathaway's Catwoman (or at least, Selina Kyle) and Tom Hardy's mysterious, mumbling Bane. Let's parse the trailer the only way we know how: By the numbers. At the center of Tomas Alfredson's marvelously taut espionage thriller Tinker, Tailor, Soldier, Spy (based on the John Le Carré novel previously adapted into a celebrated 1979 British miniseries) is an unusually understated turn by Gary Oldman as George Smiley, a recently retired career spy of few words quietly trying to uncover a mole within British intelligence. Oldman acknowledges a departure of sorts from the wild, often manic characters he built much of his career on -- Sid Vicious, Count Dracula, Beethoven, DEA agent Stansfield of Leon, to name a few. Some of Oldman's best-known roles are, as he described to Movieline this week in Los Angeles, more rock 'n' roll. "Smiley," he explained, "is jazz." Tinker, Tailor, Soldier, Spy Haiku Contest Winners Announced! This won't come nearly close to matching the poetry witnessed throughout last week's Tinker, Tailor, Soldier, Spy premiere giveaway contest (or the tense, masterful symphony of the film itself, chock-full of your favorite British thesps and "Pillow lipped chameleons"), but: "Thanks to all who played/With odes to Tinker, Tailor.../Winners after the jump!" 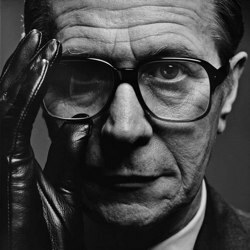 Attention all spy genre enthusiasts, Cold War buffs and Gary Oldman fans: Movieline is giving away three (3) pairs of VIP tickets to the Los Angeles premiere of Tinker, Tailor, Soldier, Spy to the trio of readers who come up with the most clever haiku poems dedicated to one of the film's stars.